Posted June 5, 2018 by Doc & filed under Articles, Fishing. 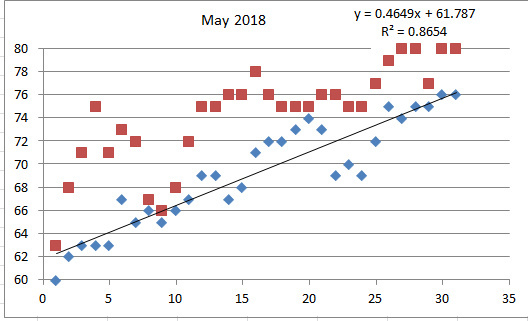 May’s water temps jumped up after a slow start. Surf had a low of 60, high of 76, sound a low of 63 and high of 80. Average surf was 69.2, which was + 11 From April’s average, sound 74.3, +14 above April’s average. Check out the graph.